I work downtown and we have some of the best restaurants around. One of my favorite things to do is replicate favorite dishes from these restaurants at home. Taco’s are Taco’s are Taco’s but this version marinates the shrimp in a Michelada sauce and finishes with a sprinkle of bacon bits taking it right over the top as far as freshness and taste. The following is my recipe. I can’t have beer because I follow a gluten free diet so I adjusted it slightly. I have also included a link to a recipe for the real Michelada cocktail. If I were you, I would experiment a little based on your likes by adding some of the ingredients in the drink recipe that I could not include in mine. The best way to do this is start with a small amount of the ingredients that you like and adjust from there after tasting. Here is my recipe and links to the original drink so you can adjust your recipe when you make it. Have fun, Happy Cinco de Mayo and as always “Treat your family like friends and your friends like family”. Remember to go organic as much as you can on all ingredients. You can also add the following: Soy sauce, worchestshire sauce, beer. Start by removing the shells from the shrimp. In a mixing bowl place shrimp, clamato juice, tabasco sauce and a twist of ground pepper if you like. Toss shrimp thoroughly and set aside. Preheat a frying pan and add 1-2 tablespoons of butter and melt. Add about 6-8 shrimp at a time cooking for about 2-3 minutes each side. If the pan gets dry add some of the marinade and a little water. This will steam cook them as well. Remove from pan and place in another bowl. Once all shrimp are cook and cooled enough, chop into about 4 pieces each. Pour the remaining sauce/marinade into the frying pan and heat on high until it bubbles. Pour over the shrimp pieces and toss. Steam your corn tortilla’s by placing them on a plate and covering with a damp paper towel in the microwave for 30 seconds. Some people do not like corn tortilla’s and flour tortilla’s just take something away from the overall taste. 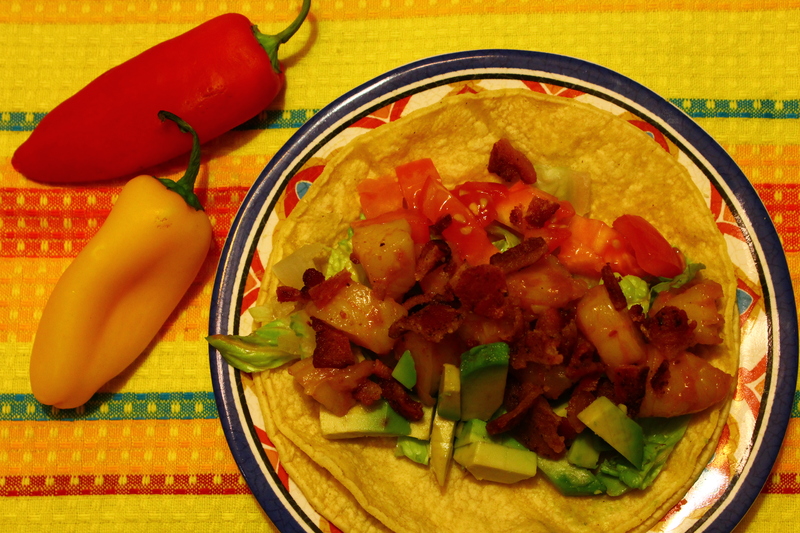 There are several ways to serve this recipe, as a soft taco or a salad. Since our family is divided on the tortilla issue, I put all ingredients in separate bowls/platters and let them decide. If you want to adjust this to make appetizers, use samll clear dessert dishes and layer the ingredients using the corn tortilla as a garnish. 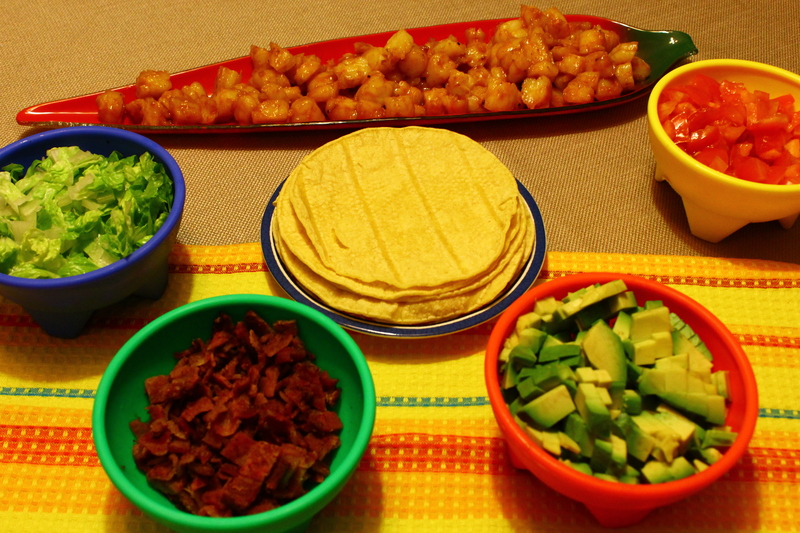 Aside | This entry was posted in Appetizer, Cinco de Mayo, Cocktails, cooking, Cooking How To, Family, Food, friends, Mexico, Recipe, Shrimp, Uncategorized and tagged appetizers, cooking, family, food, friends, how to, organic, photos, recipes, shrimp. Bookmark the permalink.